IAD Airport Parking Your car can pay for your parking space. IAD Airport Parking : TravelCar Rentals and Ridesharing firm offers slashed parking prices and affordable valet services at the Washington Dulles International Airport. Navigating in the busy Washington Metropolitan area is now faster and efficient with a car rental from TravelCar. TravelCar serves to facilitate your smooth travel to and from Dulles Airport. At TravelCar several great things happen to make traveling easier. One, travelers can make early bookings on parking slots and car rentals to their respective airports. Two, clients can request for valet services when they drive to an airport. Three, travelers can list their cars for the ridesharing service and leave their car with us once they are airborne. This firm looks out for your interests by helping you save on costs of traveling as an individual or a group. Moreover, it’s not just about the costs, using a car rental from TravelCar is the most comfortable way to move around Washington DC. Additionally, if your car is listed, you get to make money while away on your trip. Washington Dulles International Airport sits on Fairfax and Loudoun Counties in the State of Virginia. Dulles covers 13,000 acres of land on the Loudoun-Fairfax line. IAD is owned and managed by the Metropolitan Washington Airports Authority. It was built in the year 1962. It is the third busiest airport in the Washington Metropolitan area after Baltimore/Washington International Airport and Ronald Reagan International Airport. Washington Dulles International Airport is one mile from Dulles City in the State of Virginia, United States of America. It is 26 miles away from Downtown DC. The average annual passenger traffic at Dulles Airport is over 21 million with a huge percentage of that heading to the Mid-Atlantic. Washington Dulles International Airport is third in total passenger boarding per annum in the Washington Metropolitan area. Washington Dulles International Airport is the 26th busiest airport in the U.S.A and is a central hub for the United Airlines. The Baltimore/Washington metropolitan area hosts three major airports: Baltimore/Washington International Airport, Ronald Reagan Washington National Airport, and Washington Dulles International Airport. Other significant airports close-by include Harrisburg International Airport and Richmond International Airport. Airport’s Traffic 22,892,504 passengers as of the year 2017. TravelCar is a top-rated car rental company in the United States of America. The firm is known for its competitive parking prices and is top on the list for many travelers in the U.S.A. This company offers slashed parking prices as compared to similar companies. Its presence in airports is functional in providing transport solutions to individuals or passengers moving in groups. One key thing to mention is that TravelCar is accessible anywhere in the country. Whether you are traveling by air, sea or road, you can still access our services to your desired destination. Of all parking arrangements, TravelCar will give you a mouth-watering deal that will fit your budget. 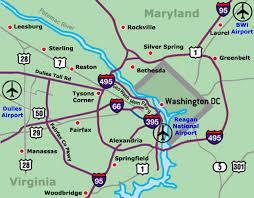 Metro rail station is the closest rail station to Washington Dulles International Airport. The Silver Line Train carries travelers from Downtown DC to the airport. Drive yourself to classy hotels in the region and enjoy warm hospitality. Below are some of the hotels available and the distance from Dulles Airport. TravelCar parking lots are well secured to ensure maximum security of your private vehicle or car rental. The parking lots are covered, gated and manned by security guards. There is CCTV video surveillance inside the parking garages. Once you leave your vehicle at our parking lots, they are washed and serviced. Dulles International Airport is made up of one primary terminal and two midfield terminals hosting Concourse A/B and Concourse C/D. The airport has a total of 123 gates and 16 hardstand points of departure. Plane-mates are used in boarding and alighting planes at IAD. Midfield Terminal A “H” gates, has 47 gates United Express, Etihad Airways, Air France and Virgin Atlantic. The Main Terminal Contains the four “Z” gates Air Canada Express, Frontier Airlines, British Airways, Saudi Arabian Airlines, Delta, JetBlue, Korean Air, Air France, Virgin Atlantic, KLM, Northwest and American Airlines. 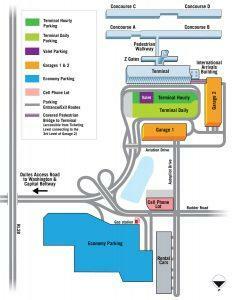 Terminal Parking allows for hourly and daily parking and is stationed at the Terminal front. The terminal building also hosts Garage 1 and Garage 2. Garage 2 has charging stations for electric vehicles. The economy parking area is available for long-term parking solutions while the Cell Phone Lot is accessible for a maximum period of one hour. The booking process is simple and direct to the point. All bookings are made online on our website www.travelcar.com. We have agents online 24/7 to help you with the booking process in case you get stuck. If you anticipate a flight to a specific region, get a quote for the parking and valet services in the exact airport you wish to land. Early bookings attract a lovely bonus! A majority of flights are pre-arranged, and so should be your transport arrangements after the trips. Often, it is costly and tedious to get a ride to town, most especially when traveling with much luggage and with kids. If you were to book a cab, it probably wouldn’t fit all the members of your family. That is why a car rental from TravelCar is convenient. The reason is, this firm gives you a wide array of vehicles to choose from. In this case, a family van would be most suitable, complete with car seats for your little kids. Imagine a scenario where you have no one to drive you to the airport and hence no one to drive your car back home. We have a car listing service that allows travelers to share their vehicles with other travelers. It reduces the hustle of continually moving cars to and from home and saves other travelers the pain of looking for suitable cars. This listing service is exceptionally vital in busy airports like Dulles Airport. Washington is awash with traffic, especially during peak hours. Public transport means go with a definitive schedule, you can’t manipulate them to suit your needs. However, with TravelCar, your hired ride can give you access to the airport within a shorter period than public buses. You can ride at your own pace as per the legal limits. Note that some public means of transport are not responsible for your luggage and may have very little room for excessive luggage. With a car rental, you get to carry your luggage and arrive at IAD with everything intact. Enjoy the freedom to visit exciting places in the region that would otherwise be difficult while using public means. With the right vehicle, you get to experience the best travel. Valet service is the process where a company attendant assists a driver in parking a vehicle in designated areas and help with the luggage. At TravelCar, you are assured of low-cost, top-quality valet experience. There is an active support team that is available 24/7 to answer all your questions. The customer service team is friendly and will respond to your comments or concerns. Road Silver Line Express Bus Metro’s Silver Line Bus connects passengers from Wiehle-Reston East Metrorail Station to Dulles Airport. Bus leaves every 15 minutes during peak hours and every 20 minutes during off-peak hours. Road DC Metro Bus Metrobus operates on the 5A to link Downtown DC and Dulles International Airport. The bus has stops at Herndon-Monroe park and ride lot, Rosslyn Metro Station, and L’Enfant Plaza. Metrobus leaves every 30 minutes from 5:55 am on weekdays and from 6:35 am. Washington Dulles International Airport is primarily served by Dulles Access Road (State Route 267) and State Route 28. Interstate-66 on your West to exit 67 if driving from Downtown Washington DC. You will cover 16 miles to Dulles Airport. From Baltimore, head South on Interstate-95 to exit 27 and then to exit 45A. Access the airport from Richmond by heading North via Interstate-95 to exit 170B and after that to exit 45. From Roanoke in Southwest Virginia and West Virginia, connect Interstate-81 with I-66 on your East to exit 53. Use Route 28 to Dulles Airport.